Share this new art experience with your family and friends now! The artist has applied her unique and innovative Hebrew calligraphy in writing Psalms Chapter 23. The Kaishu style gives a graceful and elegant look of the prayer, bringing the audience a sense of serenity and peace. 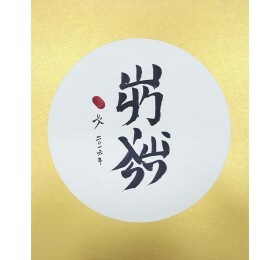 These elegant fan shaped soft Shikishi boards are pre-mounted and ready to be framed. They are made of a variety of colours and plain rice paper mounted on soft art board. Colour selections are plain gold and silver print, or brocade decorative art print. Start reading from the right hand corner מזמור, then from up to down, right to left. 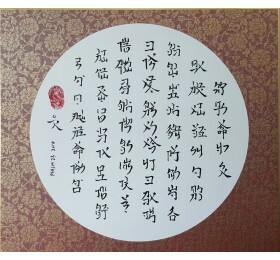 At the end is the artist’s signature 文 (Man in Cantonese and Wen in Mandarin), title, date of completion, and a red fingerprint. A personalized message can be added in Hebrew or English. Please email us your personalized message after you have placed the order. Maximum number of words is 15. If you wish the artwork to be framed, please contact us and we shall advise you on the additional costs and delivery time. Price is for artwork only. Fees for overseas delivery is at a flat shipping rate of US$10. Delivery within Hong Kong is free, please enter coupon code "FREEHK" upon checkout. See our Delivery Information for more details. The artist has applied her unique and innovative Hebrew calligraphy in writing Psalms Chapter 23. The Kaishu style gives a graceful and elegant look of the prayer, bringing the audience a sense of serenity and peace. These elegant moon shaped soft Shikishi boards are pre-mounted and ready to be framed. They are made of a variety of colours and plain rice paper mounted on soft art board. Colour selections are plain gold and silver print, or brocade decorative art print. Please email us your personalized message after you have placed the order. Maximum number of words is 15. Price is for artwork only without frame. Please contact us if you wish the work to be framed, we shall advise you on the additional costs and delivery time. The artist has applied her unique and innovative Hebrew calligraphy in writing these two powerful words שמר ישראל Shema Israel. 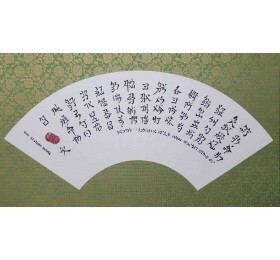 The Kaishu style gives a graceful and elegant look of the words, bringing the audience a sense of serenity and peace. These elegant moon shaped soft Shikishi boards are pre-mounted and ready to be framed. They are made of a variety of colours and plain rice paper mounted on soft art board. Colour selections are plain gold and silver print, or brocade decorative art print. On the left is the artist’s signature 文 (Man in Cantonese and Wen in Mandarin), date of completion, and a red fingerprint. A personalized message can be added in Hebrew or English. Please email us your personalized message after you place the order. Maximum number of words is 15. Price is for artwork only without frame. Please contact us if you wish the work to be framed, we shall advise you the extra costs and delivery time. Thank you for visiting Mangraphy.com, an online shop by Jewish Chinese artist Carol Man. New works will be added regularly.